Yeshurun benefits from being right at the junction of two eruvim – one serving the east of Edgware and Mill Hill (the Edgware eruv) and one serving the west of Edgware, Canons Park and Stanmore (the Stanmore and Canons Park eruv). Yeshurun has been actively involved, both financially and in project terms in the ventures to construct both eruvim. The Edgware eruv was initially suggested by the Edgware Adass Congregation and in its later planning stages extended to include Yeshurun. The Edgware eruv opened in October 2007 and has transformed the lives of many orthodox people in the area. 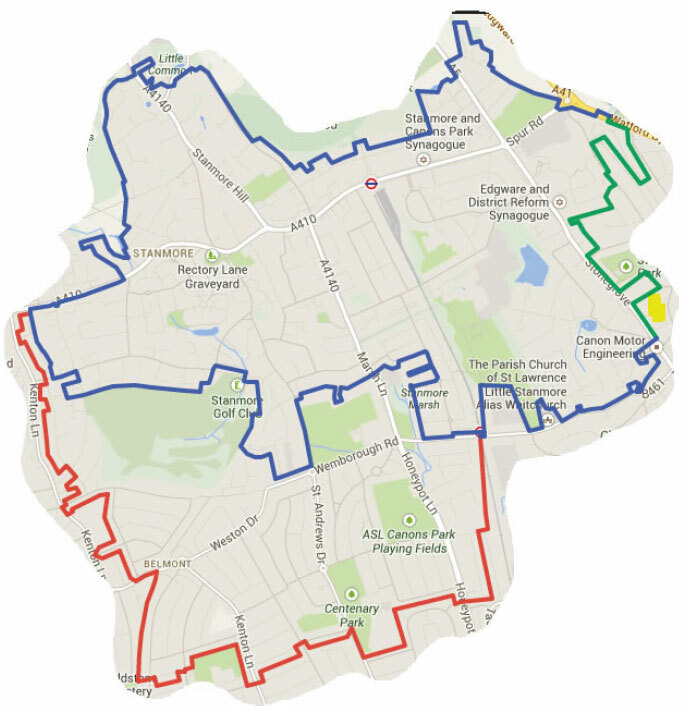 The Stanmore and Canons Park eruv was initially suggested by Stanmore Synagogue and incorporated Yeshurun western community in its early planning. It opened in November 2011. The two eruvim join on Stonegrove, the road forming the western boundary of Yeshurun’s site. A third eruv in the area, the Belmont Eruv, opened in November 2013. This joins the Stanmore and Canons Park Eruv in a way which makes it possible (with a short detour) to link Belmont Shul with Yeshurun by using all three eruvim. All the eruvim have been constructed according to the highest standards specified by halachah, with great effort made to fulfil even minority opinions among halachic experts in their construction. They are used by many of the Edgware and district rabbonim and we encourage everyone to use it. A letter of endorsement from the Edgware rabbonim, including Yeshurun’s Rabbi Alan Lewis, is here. You can use the eruv on shabbos and yom kippur to wheel pushchairs and wheelchairs, bring a tallis or siddur to shul, or a book to a shiur, or to carry glasses, house keys or other permitted items necessary for enjoying shabbos. You can’t carry items required for use after shabbos or that may not be carried on shabbos. Any item that is muktzah – including an umbrella even if opened before shabbos – may not be carried. You cannot use the eruv either to bring gifts to hosts. More detailed dos and don’ts are on the Edgware eruv website. The eruvim are inspected every Friday morning and again just before Shabbos, to ensure they are intact. The community is notified if they’re not, including posting the status on the eruv websites : http://www.stanmore-eruv.org.uk,http://www.belmont.theus.org.uk/ and http://www.edgwareeruv.org. Because of the complexity of the laws of eruvim, no one should take it upon themselves to extend the eruv, or attach wires or any other addition to the eruv. The eruv constitutes a closed and complete entity in and of itself. Go here for a map of the Edgware Eruv. Yeshurun is towards the bottom left hand corner of this map, marked “PW” which we’ve worked out stands for Place of Worship. Go here for a map of the Belmont Eruv. Yeshurun is within the green area on the map, which is at the western boundary of the Edgware eruv (not shown in full on the map but Yeshurun is clearly marked in yellow below). Go here for a map of the Mill Hill Eruv. This also gives details of how to cross between the Edgware eruv and the Mill Hill eruv.